Q: What are the constituents of concern (COCs)? A: Most of the COCs associated with the landfill have naturally degraded into non-toxic compounds. However, ongoing monitoring has indicated that a few constituents remain in the groundwater at levels that, in places, are reported above state drinking water criteria. The primary COCs that we are tracking at the site are benzene, tetrahydrofuran (THF), and 1,4-diethylene dioxide. Benzene is a colorless flammable liquid that is a component of gasoline. THF is used in a number of ways, including making rubber, cellophane, and adhesives that are used to join plastic pipe. 1,4-diethylene dioxide, often referred to as "1,4- DD" or "1,4-Dioxane" was most commonly used in the past as a stabilizer for solvents. 1,4-DD is also commonly found in some household products, including cosmetics and soaps, as well as gasoline and pesticides, so it would not be unusual to find low levels of this compound in the environment. 1,4-DD is sometimes also referred to as "dioxane," not to be confused with "dioxin," which is a term used to describe a completely different compound or class of compounds with very different toxicological profiles. Q: What is the current drinking water standard for benzene, 1, 4-DD, and THF? A: Michigan law (Part 201 of the Natural Resources and Environmental Protection Act) currently sets the standards or "criteria" for these constituents in drinking water at: 5 parts per billion (ppb), 7.2 ppb, and 95 ppb, respectively. Q: Has the MDEQ recently changed their standard for 1,4-DD? What action has the KLA Group taken in response to the change in the 1, 4-DD standard? A: On March 14, 2016, MDEQ announced that it would formally propose a new drinking water standard for 1,4-DD of 7.2 ppb, lowering the standard from the previous level of 85 ppb. Based on preliminary information provided by MDEQ, the KLA Group notified area residents of the anticipated change before MDEQ announced the proposed standard. As part of that notification, the Group offered free connections to the municipal water supply, or an alternative water supply, with free bottled water offered in the interim for residents above the anticipated new standard. In addition, the Group sampled over one hundred residential wells in order to monitor and assess the water use accordingly. In October of 2016, the MDEQ finalized a new rule formally changing the standard from 85 ppb to 7.2 ppb. Q: What are the health risks associated with these constituents? A: Based on the Part 201 drinking water criteria, if the COCs exist in groundwater at concentrations below the criteria, then the water is considered safe to drink and for other potable uses. The Part 201 drinking water criteria are calculated based on the assumption that a person will drink the water 350 days per year for a lifetime. Q: Does the federal government have a drinking water standard for 1,4-DD? A: The federal government has not set a drinking water standard (often referred to as a maximum contaminant level or "MCL") for 1,4-DD. However, in recent years, U.S. EPA has issued guidelines, or recommendations, to guide cleanup activities involving 1,4-DD. For Superfund cleanups generally, U.S. EPA uses an acceptable range of cancer risk from 1 in 1,000,000 to 1 in 10,000. Applying that acceptable range results in guidance for groundwater used as drinking water ranging from 0.35 ppb to 35 ppb. This is based on drinking 2 liters per day for 70 years. For the West KL Avenue site, EPA has adopted and applied Michigan's previous drinking water standard for 1,4-DD of 85 ppb, but intends to re-evaluate the adoption and use of that standard in light of Michigan's new standard of 7.2 ppb, which became effective in October of 2016. See the EPA Fact Sheet. Q: What is happening with the COCs in the groundwater? A: Certain constituents in the landfill have leached into the groundwater. This can result in the migration of those constituents from the landfill. Approximately 90 percent of the leached constituents have naturally degraded into non-toxic compounds. A few COCs, however, have been reported as detected in groundwater above Michigan drinking water criteria. This groundwater is generally stable or the concentrations of COCs are lessening, with some localized variability (i.e., some sample results might fluctuate higher or lower, but the trend is generally stable or lower). The direction of groundwater flow is west-northwest, with a relatively narrow area of groundwater that has reported COCs concentrations above current drinking water criteria stretching from the landfill to just beyond 1st Street near West Main (Hwy-43). Q: Do newly reported low level detections of 1,4-DD indicate that the impacted groundwater is expanding? A: Not necessarily. Given that 1,4-DD is found in household products (e.g. soaps) and that there are hundreds of septic systems in the area, along with other potential sources of 1,4-DD, it is difficult to determine whether newly reported low-level detections are from septic systems or are associated with the landfill. Nonetheless, the KLA Group will continue to routinely monitor residential wells (at no cost to the resident) and provide alternative water supplies as indicated. Q: Is groundwater flow to the west-northwest toward the Paw Paw River drainage and associated springs or wells (e.g. Wolf Creek Fish Hatchery), and are those areas at risk? A: No. The groundwater flow is more to the northwest, and is more than a half-mile north of the Hatchery, and currently those areas are not at risk from the West KL Avenue site. These bodies of water are at a distance that is beyond the area impacted by the West KL Avenue site and extensive sampling of the area confirms there is currently no risk to these surface water bodies from the landfill. It is not expected that these bodies of water will become adversely affected by the West KL Avenue site. Levels of 1,4-DD in the groundwater are currently at least 10 times lower than the level that the MDEQ has determined is protective of aquatic life. We continue to test the waters and monitor the situation. Q: Could the COCs migrate as vapor into people's homes? A: Vapor intrusion is not considered a concern related to the site given the relatively low concentrations of the COCs and the fact that the area of impacted groundwater is far below ground surface, often as much as 40-50 feet below ground. Q: What is the Groundwater Restricted Zone? A: To protect public health, the consent decree governing activities at the site requires that the use of groundwater for drinking water purposes be prohibited if that groundwater contains COCs above Michigan drinking water criteria or if that groundwater is within a 1,000 foot downgradient precautionary "buffer zone." The "groundwater restricted zone" or "GRZ" defines the restricted area and is a legal mechanism that prohibits the use of potable groundwater wells (except in limited circumstances) as part of the County's Sanitary Code. Q: Is this the first groundwater restricted zone in Kalamazoo County? A: No, there are already two other groundwater restricted zones in Kalamazoo County unrelated to the landfill. One is in the City of Kalamazoo and involves about forty two properties; the other is located in both the City of Kalamazoo and in Kalamazoo Charter Township and includes 398 parcels of land. Q: How does the process work to establish the Groundwater Restricted Zone (GRZ)? A: The KLA Group sent a draft map showing the proposed area of the GRZ to USEPA, which the USEPA approved. 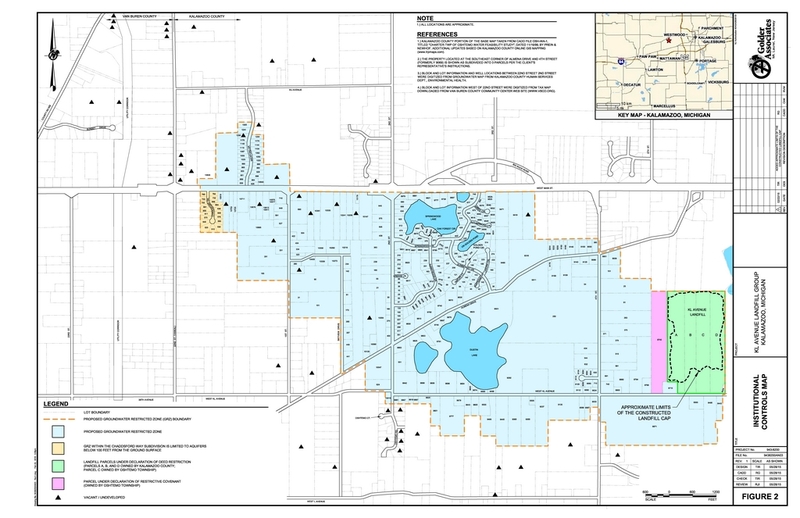 After USEPA's approval of the proposed GRZ limits, the KLA Group submitted an application to Kalamazoo County to adopt the GRZ as a well water "restricted area" as defined in the County's Sanitary Code. The County then held public hearings and, after consideration, approved the GRZ. The GRZ became effective on March 9, 2016. After that date, wells are legally prohibited within the GRZ unless a waiver is obtained from the County and MDEQ per Sanitary Code requirements. Anticipating approval of the GRZ, the KLA Group worked with property owners and already had most homes in the proposed GRZ connected to the municipal water supply before the GRZ became effective. The GRZ will likely need to be amended in the next few years based on the revised drinking water criterion for 1,4-DD. Q: Where is the GRZ today? A: The GRZ extends from the landfill to beyond the south edge of the Wickford Drive neighborhood (almost to Van Kal Ave.); however, it will likely need to be expanded in the future based on the revised 1,4-DD criterion. See map of current GRZ. Q: Why is my property in/out of the GRZ? A: If your property is located in an area where COCs have been detected in groundwater above drinking water criteria, or your property is within 1,000 feet downgradient of a detection above drinking water criteria, then your property is included in the GRZ. If you are outside this area, then your property is not included. Q: What criteria are used by the KLA Group for determining which wells within and beyond the current GRZ are monitored? A: The KLA Group routinely monitors residential wells in the area down-gradient of the landfill in accordance with an EPA-approved Residential Monitoring Plan. Over 100 residential wells and monitoring wells have been monitored on a regular basis, and new wells are added as appropriate. In deciding which wells to monitor, the Group looks at current and past well results, groundwater flow direction maps and models, and then communicates proposed monitoring locations to the EPA and MDEQ for their review and approval. With the recent change in the criterion for 1,4-DD (from 85 ppb to 7.2 ppb), the KLA Group has expanded the area to be sampled, primarily to the northwest (i.e., to include Josiane Drive) and southwest. If there are any detections of landfill-related constituents in the expanded area of sampling, the Residential Monitoring Plan identifies a process and monitoring frequency for routine monitoring. Q: Is the Chaddsford Way subdivision included in the GRZ? A: Yes, the Chaddsford Way subdivision is included in the GRZ. However, for Chaddsford Way, the KLA Group and USEPA were able to determine that all of the existing wells in the subdivision draw from an un-impacted shallow aquifer that overlies and is separate from the deeper impacted aquifer. These two aquifers are physically separated by a thick clay layer, and therefore impacts to the upper aquifer are considered unlikely. Therefore, the GRZ is limited to the deeper impacted aquifer for the Chaddsford Way subdivision. The KLA Group is conducting regular monitoring in the Chaddsford Way subdivision to ensure that the wells remain safe to use. Q: Is the KLA Group paying for residents' monthly municipal water bills? A: No. The KLA Group has, however, agreed to pay for the cost of extending the water mains, hooking up individual homes, and properly abandoning current wells, thereby eliminating potential exposure to constituents, including nitrates, bacteria, and other potential contaminants from the hundreds of private septic systems in the area. With the help of funding from non-municipal contributors, the municipalities that are members of the Group have not had to raise taxes or impose assessments to do so. Homeowners will be responsible for paying their monthly water bill based on their individual use. The cost of operating, servicing and maintaining/replacing a domestic well can be comparable to the cost of municipal water over time. It should be noted that many of the issues associated with the KL Avenue Landfill site are due to the activities of parties that are not part of the KLA Group. Many of these businesses or people who sent waste to the landfill are bankrupt, deceased or are no longer collectible. Q: Some people say that the City water supply is "hard"? What does that mean? A: The City water supply contains minerals, particularly iron and calcium that can affect the taste and color of the water. Water containing these minerals is sometimes referred to as "hard" water. This "hardness" does not pose a health risk, and can usually be addressed with a water softener.